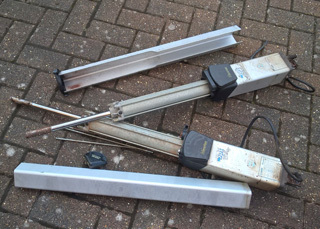 Electric gate repairs in London are one of our key service we provide in our business. We are proud of our professional team of fully qualified service engineers and the efficiency they bring to all the work we carry out. We not only provide electric gate repairs in London but all the surrounding areas. The work we undertake is always completed in a timely manner, with minimum disruption to residents or staff. If the gates cannot sadly be repaired we can offer electric gates in London that have all the kind of security features that all good automated gate systems should have to deter intruders and eliminate potential costly damage. Why we carry out Electric Gate Repairs in London? According to the Metropolitan Police crime statistics there were 26,208 non-residential burglaries and 46,223 burglaries in the home in the 12 months leading up to July 2015 in London alone. For both residential and commercial properties, maintaining a robust electric gate system can give you peace of mind for the security of your property. 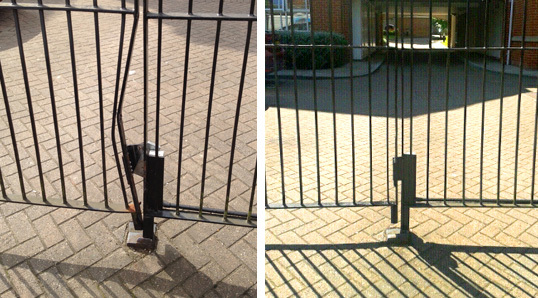 We have many examples such as this gate repair in Stanmore. Our CAMESAFE Installers have the wealth of experience and knowledge gained from comprehensive training to be able to offer the required repairs and solutions to all security gates and electric gate repairs in London. Where necessary we are able to supply complete system upgrades, including upgrading manual gates with automated solutions as required. Our surveying service ensures an easy and efficient transition from design to installation. A member of our site survey team will be happy to attend your factory, shop, office or home to give you free, no obligation advice, detailing all the potential systems to ensure your final electric gate solution is perfect for you. If you have a requirement for repair, maintenance or servicing of your electric gates in London, the Home Counties, or surrounding areas, then please get in touch today.